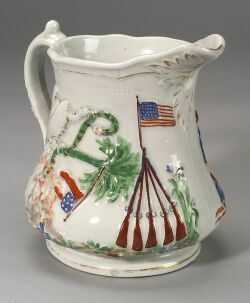 Civil War Commemorative Polychrome Porcelain Pitcher, Millington, Astbury, and Poulson, Trenton, New Jersey, c. 1861, modeled by Josiah Jones and decorated by Edward Lycett, the pitcher depicting the Marshall House Incident in Alexandria, Virginia on one side, the reverse with an eagle biting a snake above a fallen Confederate flag, with the Union flag flying high above five rifles, applied foliate handle, gilt highlights, raised maker's mark "M,A,P, TRENTON N.J." in an oval on base, (base chip, gilt wear), ht. 8 3/8 in. Note: The Marshall House Incident happened in 1861 when Northern troops captured the seaport town of Alexanderia, Virginia. A Union officer named Col. Elmer Ellsworth, while marching up King Street, saw the Confederate flag atop the Marshall House hotel and decided to retrieve it, now that Alexandria was under Union control. After removing it, Ellsworth descended the stairway with the banner and was shot and killed by James Jackson, the innkeeper who was said to have declared as it was raised, that it would be removed "over his dead body." Jackson was then killed by one of Ellsworth's men. 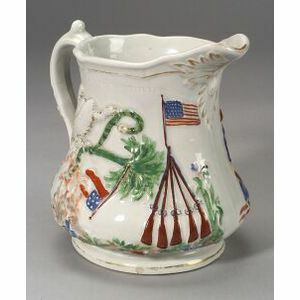 Northerners viewed Ellsworth as a hero who died in the line of duty while Southerners praised Jackson as a patriot who was killed defending his home and private property.